This sleek No. 21 tote combines fashion and function thanks to a modern foldable design. 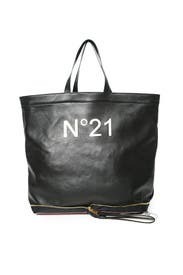 Black smooth leather tote bag with front No. 21 logo. Bottom zipper detailing allows the bag to be folded up and compact. Open top design and two carry handles. 13.4"H x 18.5"W x 5.9"D.
I rented this hoping that it would be a great travel tote for a trip to Europe. The leather is way to soft and unstructured making the tote flimsy and the shoulder straps are not long enough to go over your shoulder. Would be great for a vacation, could fit easily into your suitcase.